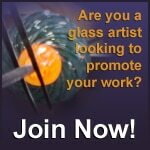 In 1980 the idea for Michigan Glass Month (MGM) came from Ferdinand Hampson, the owner of Habatat Galleries, and Mark Talaba, a local glass artist looking for a way to maximize public awareness of several glass art events that were taking place annually around the greater metro-Detroit area. In the following years a committee of 10-12 individuals was formed. This group included local artists, gallery owners, museum curators, collectors, and instructors for the purpose of developing various events that would provide education and promotion of the glass arts. A color brochure developed listing the various glass events including gallery and museum exhibitions, lectures, tours, workshops and glass demonstrations. The majority of the events are in the greater metro-Detroit area. Additional glass events take place all over the state of Michigan and occasionally include the neighboring states of Ohio, Indiana and the province of Ontario. Many individuals have worked to establish April- Michigan Glass Month as a tradition promoting the many aspects of glass as an art form. The range of expressions includes: the glass vessel, sculpture, stained glass, lamp work and jewelry; contemporary and historic glass; fine art as well as unique functional glass. Local and international artists as well as new emerging glass artists look forward to this venue to show their best works developed in the previous year. In 1988 the MGM Committee shifted its emphasis from brain storming ideas and directly promoting individual events to just producing the MGM brochure and encouraging coordination of event happenings. The committee was subsequently reduced to three members: Sylvia Vigiletti, a glass artist, Jean Sosin, a glass collector and Herb Babcock, a glass artist and professor, College for Creative Studies. 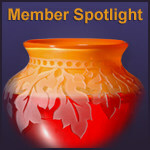 In 2007 the committee reformed with Herb and two new members, Michelle Plucinsky, partner Furnace Design Works and of Glass Academy and Ken Gross, Director, The Alfred Berkowitz Gallery, UM Dearborn. John Wood, glass sculptor, replaced Ken in 2011. Brian Surowiec, technology consultant and cofounder of Strawesome, joined the board in 2012. After many years, the success of the Michigan Glass Month has become a self-perpetuating entity into itself. Every spring collectors, artists, galleries and the general public look forward to see what new energies of expression will be revealed through glass. In place of the MGM brochure, we are creating a dynamic web presence promoting Michigan Glass for spring and throughout out the year.